Reconstructing the bacterial genomes was no easy task, as the material available—from old human bones—contained less than 0.1% of bacterial DNA. The researchers developed an extremely sensitive method for separating the two kinds of DNA and for reconstituting the target genomes with an unprecedented level of precision. "We were able to reconstruct the genome without using any contemporary strains as a basis," explains study co-author and EPFL scientist Pushpendra Singh, who worked closely with Johannes Kraus and team from Tubingen University in Germany. The results are indisputable: the genomes of the medieval strains are almost exactly the same as that of contemporary strains, and the mode of spreading has not changed. "If the explanation of the drop in leprosy cases isn't in the pathogen, then it must be in the host, that is, in us; so that's where we need to look," explains Stewart Cole, co-director of the study and the head of EFFL's Global Health Institute. 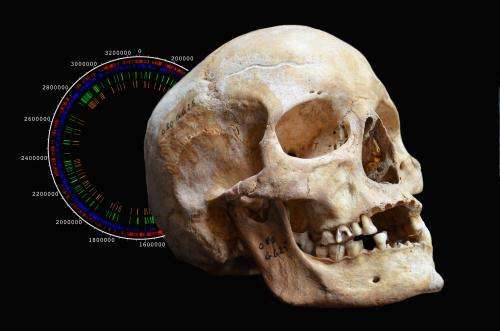 Many clues indicate that humans developed resistance to the disease. All the conditions were ripe for an intense process of natural selection: a very high prevalence of leprosy and the social isolation of diseased individuals. "In certain conditions, victims could simply be pressured not to procreate," Cole says. 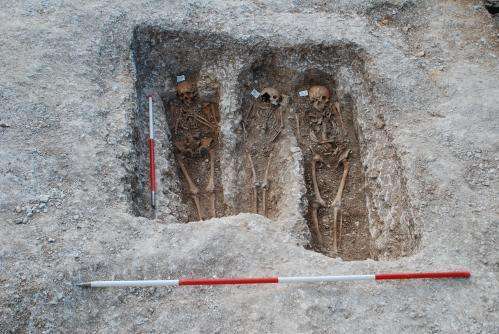 "In addition, other studies have identified genetic causes that made most Europeans more resistant than the rest of the world population, which also lends credence to this hypothesis." 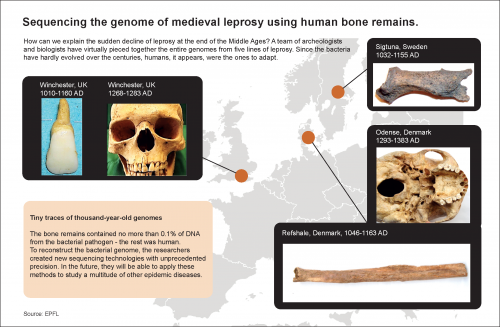 One interesting thing the researchers discovered was a medieval strain of Mycobacterium leprae in Sweden and the U.K. that is almost identical to the strain currently found in the Middle East. "We didn't have the data to determine the direction in which the epidemic spread. The pathogen could have been carried to Palestine during the Crusades. But the process could have operated in the opposite direction, as well." In addition to the historical significance of the research, the study in Science is important in that it improves our understanding of epidemics, as well as how the leprosy pathogen operates. Sequencing methods designed as part of this research are among the most precise ever developed, and could enable us to track down many other pathogens that are lurking in foreign DNA. In addition, the incredible resistance of Mycobacterium leprae's genetic material – probably due to its thick cell walls – opens up the possibility of going even further back in history to uncover the origins of this disease that still affects more than 200,000 people worldwide each year. More information: Genome-wide comparison of medieval and modern Mycobacterium leprae, Science Express, 13 June 2013.